Today was a fun day where I checked out the Chicago holiday happenings downtown. 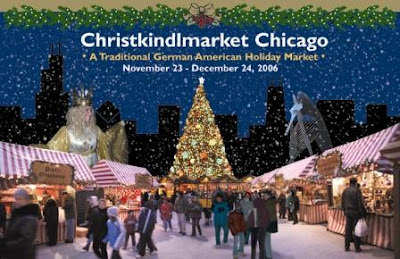 Every year the Christkindl Market sets up shop near the city center and brings in a taste of Germany to Chicago. There is so much to see, smell, taste, hear... it's almost like walking around in a European city during the holidays. 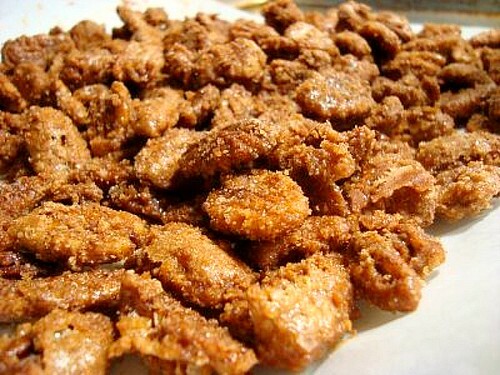 One of the main smells of the market were of cinnamon glazed nuts. There were several kinds of nuts available and it seemed as though everyone around me had some to snack on as they walked through the market. Once I got home, I was inspired to make some. The recipe that inspired me was from here. I adapted it to give it some more flavor using Pumpkin Pie spice to make it as close to the Bavarian Style pecans and they came out just as good as the ones in the Market! Preheat oven to 250 degrees. Prepare a baking sheet by lining it with parchment paper. In a bowl, combine the egg whites, vanilla and water. Whisk until frothy and place in 1 resealable bag. In the other resealable bag, combine the sugars, cinnamon, pumpkin pie spice, and salt. Mix thoroughly to fully combine. Place 1 cup of pecans in the egg white mixture. Seal bag and toss to coat. Remove only pecan halves and place in a medium bowl. Be sure to keep any remaining egg white in the bag. Coat the remaining pecans with the egg white mixture in the sealable bag and set aside in the bowl. Place 1 cup of the egg white coated pecans in the cinnamon sugar mixture. Seal bag and toss to coat. Remove pecan halves and place in a medium bowl. Be sure to keep any remaining sugar in the bag. Coat the remaining pecans with the cinnamon sugar mixture in the resealable bag and set aside in the bowl. Pour any remaining cinnamon sugar mixture from the resealable bag into the bowl of nuts. Stir all the nuts once more in the bowl to thoroughly coat. Place coated pecans on parchment lined baking sheet and bake in preheated oven for 1 hour - stirring every 15 minutes. Store in an airtight container. Here's where you can get some authentic Beer Steins! I don't think I've seen so many ornaments in one booth! Any one need a Nutcracker? Interesting candy treat... a Marzipan Pig complete with a candy man riding it? Joelen... I saw this in my Google Reader &, not even kidding, I had walnuts in the oven less than 5 minutes later. Oh my gosh, these look amazing & the house smells delicious!! Great Idea. I went to this market on saturday and dh and I are on our way now! we go every year and it really is a jewel of chicago during the holidays. You know I've been in RI for 6 years Feb. and that is the one thing I absolutely truly miss every single year. I used to love when I worked off Michigan and Wacker so I could walk over to go to the market a lunch time and hang out after work and browse and grab a late train. That and the Windows at Marshall Field's ahhh I do miss that!! Hі! Ԝоuld you mind if I share your blog with my myspace group? There's a lot oof folks that I think woulɗ really appгeciate your coոtent. I enjoy what yߋu guys arre usuɑlly uup too. Thiss type օf clever wordk аnd exposure!